How about a nice sappy post? Today I celebrate five years of marriage to a man whom I adore and who makes me a little insane. He maintains I have no sense of humor; I maintain he’s no fun. 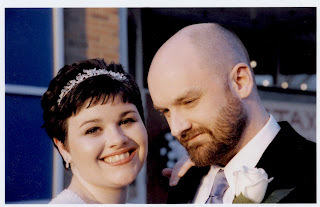 We had our first date in October of 2001 and we’ve been together ever since. We’ve laughed hysterically, slammed doors and cried (well I’ve cried, him not so much) and made fun of things (and people) and taken too many car trips to count and faced infertility and bought a house and made fun of each other and fought about politics on an almost weekly basis. He thinks I’m a Communist and I think he has terrible taste in music. I enjoy various kinds of cuisine; he would be happy eating bologna and cheese sandwiches for the rest of his life. I’m the James Carville to his Mary Matalin. We almost never have massive disagreements (sans the recent chicken discussion). We share a love of the weird and the obscene and we’re strangely obsessed with the Zodiac Killer and he doesn’t mind that I’m in love with Chuck Todd and I don’t mind that he’s in love with Allison Krauss. Our dream is to move to Oregon and have a compound and chickens and goats (okay so the chickens and goats might be more my dream than his). Frankly I can’t fathom being married to anyone else. Happy Anniversary Doug. I'm not really sure why Dorie named these Caramel Crunch Bars, they didn't seem very caramel-esque to me? Caramel or not these were a tasty little treat.The base of the bar is a shortbread with bits of chopped bittersweet chocolate and then a 'frosting' of melted bittersweet chocolate with a sprinkling of toffee chips on top. The shortbread is just flour, butter, cinnamon, salt and the chocolate. The recipe also calls for espresso or instant coffee powder but I skipped that. Dorie instructs you to spread the shortbread into a 9x13 pan but I wanted thicker bars so I just used an 8x8 pan. After it baked, I took them out, sprinkled the top with the remaining chopped chocolate and popped it back into the oven just until the chocolate melted. After taking them out of the oven a second time I spread the melted chocolate across the cookie base and then topped them off with the toffee bits. These were super easy to make and really good, very rich, I can only eat one at a time. Thanks to Whitney of What's left on the table for this week's selection! So besides highlighting my baking/cooking successes I should probably tell you about the failures. A friend brought me some citrus fruit from Florida last week and I found a recipe online for three fruit marmalade. Grapefruit, lemon and oranges, perfect. I peeled and sliced and got everything together and it was pretty looking, all orange and yellow and pink and I simmered it for almost 2 hours, just as the directions told me to. Then I added sugar and boiled and waited for it to thicken. And I waited and waited and it was still the consistency of water. Not wanting to waste it, I strained it and took out a little less than half of the liquid, assuming this was the problem. I then put the rest of the liquid and the solids back in the pot along with a little more sugar. I set it to a medium boil and went into the living room. Within ten minutes I caught a whiff of the unmistakable smell of burning sugar. My marmalade that I had such high hopes for turned into this burned and blackened mess. Blah. But this will not beat me, I plan on attempting this again next weekend. I know I can do this. I need to find another recipe though. Martha Stewart + marshmallow recipe = golden. Martha Stewart + marmalade recipe = FAIL. Besides ruining a batch of marmalade, I caught up on my This American Life podcasts. I cannot emphasize enough how much I love this radio show and Ira Glass. The Valentine's show was call 'Somewhere Out There' and for the music between segments they actually played the song "Somewhere Out There" which is from a movie of my childhood, An American Tail. For some completely unknown and ridiculous reason the playing of this song hit me at the exact right moment and made me cry. And laugh at myself for crying. This was before the marmalade failure too so I didn't have anything to cry about yet. I finished a hat on Friday, because I guess I don't have enough hats. I counted how many hats I have knit myself, including the newest one the total is NINE. Nine different hats, almost all in wool or a wool blend for someone who lives in a climate where winter lasts about 3 months. This is the Spring Beret from Natalie Larson found here, done in Berroco Palace, a merino/silk blend. I'm also working on a Cream of Spinach Scarf in Classic Elite Miracle for a friend's extremely late Christmas present. At the rate I'm going its going to be an Easter present. As I was out taking pictures of the hat I found that my planter with mint and chives in it had sprouted a whole new set of chives. It's been outside this whole time too. It was on the patio between the brick of the house and the eave of the woodshop with a ton of leaves on top so that's probably why it made it. I've also got green parsley and golden sage still in the garden. Just a few more weeks before that starts up again. I have a lot to do to prep since we're tripling the size. Happy Sunday! The Cover Cake. This is the cake shown on the cover of the book, all fluffy and perfectly cut. I was not sure that my attempt would turn out at all. But I had faith, I mean I made pate a choux, which was something I never even dreamed I could make. It just happened to be my mom's birthday so it was the perfect chance to make this cake. I didn't have any problems putting the batter together and baking it. My main issues came after it was baked. Even after cooling it when I sliced the two rounds they cracked and crumbled a lot. They also didn't rise very much at all, they were not as high as the picture suggests. The frosting was tricky, I had to engage the help of my husband at one point so I didn't risk pouring the molten lava of frosting parts on myself. Granted this would have been easier to do if I had a, ahem, stand mixer. It was a pretty tasty cake, my family thought it reminded them of a snack cake, like a Ding Dong. Everyone (well except my six year-old niece) liked it, although in the end she relented and said she liked it too. There were no leftovers either, we gobbled it up so I didn't have a chance to see how much better it would be the next day. Thank you to Stephanie of Confessions of a City Eater for this fun selection! It was Valentine's Day weekend and I had intended to post on Saturday but got too busy doing other things. Saturday morning I got up early and headed to North Memphis to help a friend of mine with a community garden he's been working on. Essentially I spent the morning working with composted horse manure. I've felt like a massive slug lately so it felt good to be outside actually working, even if it was with manure. I'm paying for it now thought because my muscles are screaming at me. After I went home and cleaned the dirt off Doug and I had a late lunch at Lou's Pizza Pie in Cooper-Young. Great pizza, I was introduced to Lou's by a friend and it is extremely delicious. We also wandered over to Burke's Bookstore right down the street. Since we're working on soon-to-be library I wanted to add some classics to our book collection. We already have a ton of books but I'm of the mindset that you really can't ever have enough books. We also exchanged gifts, we never do anything big, usually just fun thing we know the other person will like. I bought Doug this Big Lebowski tshirt, he's a huge fan. He got me a Harlan T. Bobo record, so yes I am actually getting into this record player thing. V-day night we went to Cafe Eclectic and saw our friend's improv group. Sunday I had a lunch dim sum date with some fabulous friends and we also hit a couple of estate sales. I got these doilies and again I haven't the foggiest idea what I'll do with them but I'm sure I'll figure something out. I'm also working on another first sock. I'm beginning to be concerned that I'll never actually finish a complete sock. I've frogged the other first sock that was entirely ribbing. It seemed like no matter how much I knit on it and never got any longer. This is the Carolina pattern from Socktopia done in Lime & Violet Sasquatch sock yarn. The colorway is Marilyn Monroe, pinks and greens with a little pale yellow mixed in. I'm also worried because mine doesn't really look as crisp as the others I've seen on Ravelry. It does fit though, I tried it on. It just doesn't look that great, it could be destined for the frog pond. I skipped out on TWD yesterday and I felt TERRIBLE about it. It's the first Tuesday I've missed since I started last May. But the timing was off, my mom's birthday was last week so I skipped ahead and made this coming week's selection (the cover cake). This week's selection was Floating Islands, picked by Shari. 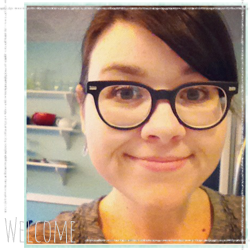 Go see her blog, Whisk: a food blog. It's wonderful, with stunning pictures and her presentation is always killer. Even though I skipped out on making the Floating Islands my kitchen was still busy. I made the Devil's Food White Out Cake which is next week's TWD selection and it was a little labor intensive. And I hosted a Memphis Knit Mafia gathering at my house last night for which I made chocolate marshmallows, these cupcakes, lemon puff pastry, broccoli, corn and potato chowder and a spinach salad. I even managed to make some (minimal) decorations. It was fun, fun, fun and even though we were missing a few of our favorite regulars, everyone seemed to have a good time. This was the aftermath. I have to say I love my marshmallows. I first made marshmallows last Valentine's Day using this Martha Stewart recipe, modified slightly (adding cocoa & extra vanilla) They are really easy to make and people are always impressed with homemade marshmallows. I've made Dorie's recipe too but as much as I love Dorie I prefer the Martha marshmallow recipe. I think it's because Dorie's recipe has egg whites and I seem to always run into problems with egg whites. I think they hate me. Regardless, I'm making more Martha-mallows this weekend for the knitta friends who weren't able to join us last night and some extras for my nieces/nephews. It has been unseasonably warm here the last few days. As much as I hate to admit it, I actually have enjoyed the warmer weather just the tiniest bit. I am sad to see the sweater weather go though. I haven't finished two of my big cold weather knitting projects yet (the Back to School Vest and the February Lady Sweater). I am excited about setting up my garden though, it'll be time to start some of my seedlings in the next few weeks. My quince is blooming now, the forsythia is budding and the narcicuss is poking up too. Donuts. Lately I have been on a donut binge. All I want is DONUTS. The lavender sweater I bought on super clearance at Urban Outfitters. It's soft and machine washable. Mermaid fabric I bought from Sew Mama Sew. I have no clue what I will sew with it though. Lou, the tiny spider who has taken up living in my bathroom. He looks like a speck in this picture because I don't have a good macro setting. Sharing an unseasonably warm February night with my family, including my adorable and high energy niece. This ball with a bell in it that I bought our cats when one of the cats has found it at 4:00 in the morning. Cat Vomit. Especially when I realize it's in the floor until its too late. That woman in the black Lexus who followed me out of our neighborhood at lunch and drove right on top of my bumper the entire time. Apparently I was not going fast enough for her. The idiot in the PT Cruiser who flipped me off last week on Poplar Avenue in front of Home Depot. Just because I didn't let you cut across three lanes of traffic doesn't mean I deserved the bird. Best.Cookie.Ever. Seriously. I have made World Peace Cookies at least four times in less than a month's time. I have shared them with several groups of people and unless they were all lying the cookies got rave reviews. They are so good, the best parts of sweet and salty. The only thing I have to complain about is that the dough is really crumbly and it's difficult to form into logs. Other than that they are perfection. I admit to eating some of the dough too. I think the dough would be an excellent mix-in to homemade ice cream Thanks to Jessica of cookbookhabit for the amazing selection! Apparently we have six more weeks of winter to look forward to, according to Punxsutawney Phil. I never took much credence in what Phil says because the climate in Memphis is little more mild than in other areas of the country. In fact yesterday we hit a high of 65. Supposedly on Sunday the high is going to be 71. In February. So Phil's prediction doesn't have much credibility around here. With the warmer weather creeping up I'm trying to decided what I want to plant in my vegetable garden this year. It'll be time to start my seedlings for peas and broccoli by the end of the month. I have the Seed Savers Exchange catalog and Johnny's Selected Seeds catalog at home. I've glanced through them but I haven't really sat down and planned out what I want to plant. Last year I had success with cucumbers, tomatoes, peppers, carrots and squash. The peas I planted succumbed to some type of vine rot early on, the strawberries weren't really worth it because I would have had to plant several rows of them to get enough to make a pint. I'll probably keep a few strawberry plants this year for the bees though. The butternut squash only produced one squash but I still might try it again. The watermelons kept getting eaten by birds or squirrels. I'm thinking tomatoes, cucumbers, yellow squash, potatoes, onions, green beans, peas, lettuce, spinach, eggplant and maybe I might try corn. We are going to triple our gardening space too. Last year we had four raised beds, I don't remember the exact dimensions, but this is what it currently looks like in the midst of winter. Luckily we have enough room to expand. For comparison this is what it looked like during the growing season last summer, in happier times. The compost pile I started last March is ready to be used I think so it'll be nice to use compost I made in my organic garden. This year I'll also need to improve my pest control options. Last year I used beer traps for slugs, which was incredibly disgusting but worked well. I hand picked off the horned tomato worms and it was oddly thrilling to find one of those little suckers and pick him off my plants. As much as a love animals I do not love tomato worms and I promptly placed them in the bird seed dishes on our patio. See how gross they are? I did some companion planting last year, mainly planting marigolds among the veggies to keep bugs away. I'm going to plan a little better this year and try more companion planting. Organic Gardening's website has really great resources on all sorts of gardening issues, including companion planting here. My mom bought me a subscription to OG for the last two years and it along with my own subscription to Mother Earth News are invaluable to me for information on gardening without chemicals and gardening for wildlife too. I bought this little windowsill herb kit at Lowe's a few weeks ago and they're growing nicely. There's chives, parsley and basil. There's a top to it that keeps it warm. I'll probably need to move them into actual pots once they get a little more established. They're just something fun to grow indoors.